I make a lot of omelette and usually make them with the same base, eggs, milk and cheese. The rest just kind of depends what’s in the fridge. This particular omelette was pretty basic, eggs, cheddar cheese, ham and spinach. I like to saute some shallots and mushrooms, but really it all depends on what’s in the fridge. I use about 3 eggs per person. Add some milk and whisk for at least 1 minute. In the meantime, steam some spinach and once cooked try and press out as much water as possible. Chop the spinach and set aside. Chop up some ham, maybe about 6 slices total and put on the side. Grate or chop some cheese. Today I had extra cheddar cheese, but goat cheese is lovely in an omelette as well as many other kinds. Actually, I think blue cheese is far too strong, but maybe you like that. Anyway, use about a tablespoon, one good pat of butter. Heat it up in a non-stick pan. It’s very important to use a nonstick pan at the beginning as omelette are difficult to make or more like, difficult to keep beautiful looking. Put your eggs in and let cook for about 20 seconds, start using a spatula to pull the eggs away from the center to the outside. You need to let the liquid stream down to have a chance to get cooked. Do this maybe 3 good times, leaving each a few seconds to give the newly added egg to cook. You don’t want to do it to much, or it may just end up as scrambled eggs. Lower the heat, if you’ve not already. 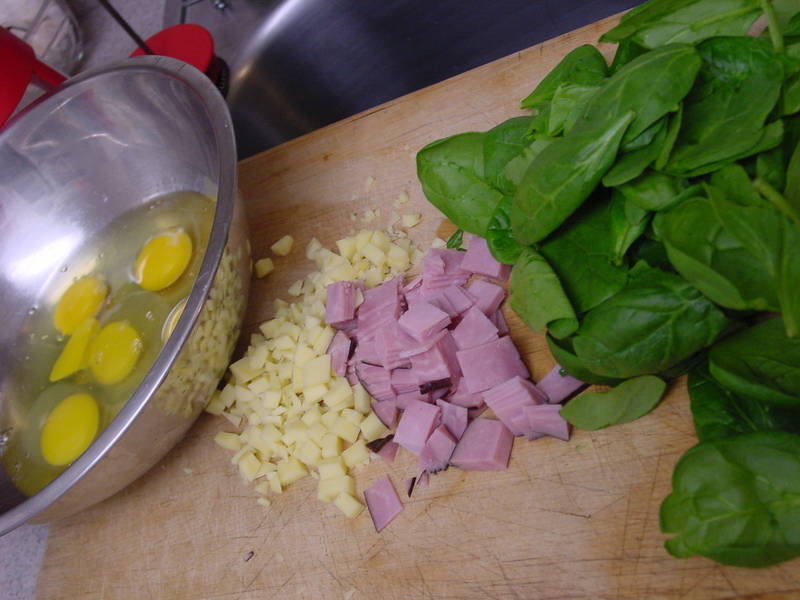 SAlt and pepper the eggs and start adding your ham, spinach, cheese or whatever you want. Take a nice sized spatula and pick-up half the omelette to flip on the other side, making an envelope of deliciousness. Let cook a bit, just for cheese and ingredients to heat up, but don’t over cook. Place on a platter for individual servings or carefully plate. Serve with a veggie or a nice, simple salad. You can just imagine a bunch of different ones. I think I really love spinach in my omelette as the main vegetable. It’s so good. You don’t have to steam your spinach ahead of time either, it worked just tossing in the leaves raw, but I like a lot of spinach and you can’t fit all the amount of raw leaves as you can steamed ones, and it reduces the liquid your omlette would get.